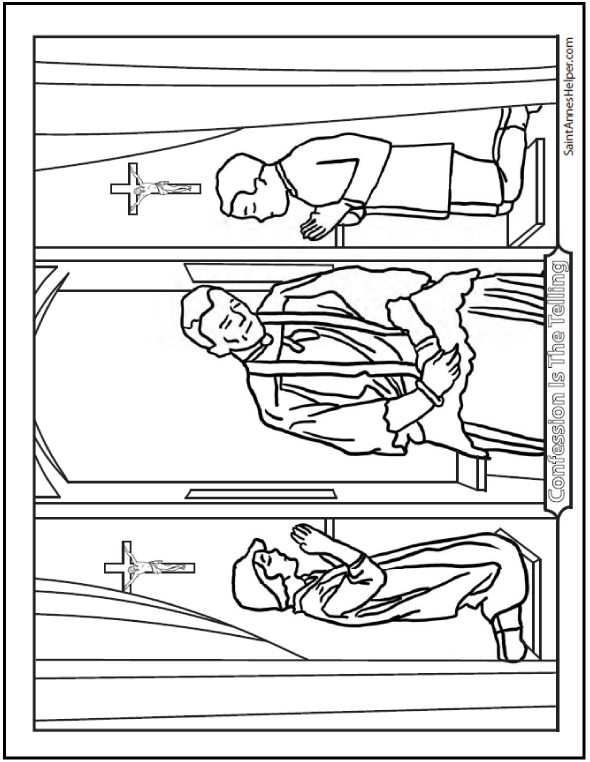 This Confession coloring page is an awesome sacrament of penance and reconciliation coloring sheet. This picture shows a priest in the confessional with a penitent and another waiting and praying. See teaching ideas below the image. This PDF prints 8.5x11" single sided. I remember how helpful it was to our children to have had a chance to see inside the confessional before they received their First Penance. At one school the Sister took the class and let each child see the place for the priest and the place where they would make their confession. When I was a child, Sister also taught us how to hold the drape for the next person. Where there is a door it is best to leave it open when you are finished confessing. Most confessionals now have an indicator light that the priest is ready and another light to show if someone is kneeling in the place for penitents. It is good show the lights to the children, so that in the future they know when they can enter. Do teach what a wonderful thing it is to have the privacy of the confessional. In a way the confessional is a symbol of the seal of confession and helps children understand that the priest is not going to tell their secrets to anyone else. St. John Nepomucene is an excellent saint story to read at this time. It's also a comfort for children to know that there's a light in the stall. A light is also helpful for reading the script, the prayers, or a list to remember to confess. Do teach that, if one needs to seek advice from the priest, one should schedule a meeting with him, especially if the confession lines are long. What is Catholic Penance and Reconciliation? 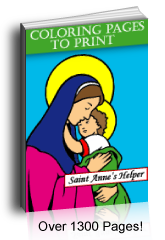 Catholic Ten Commandments and Ten Commandments coloring pages.